Otter Civets (Cynogale bennettii) are a poorly known and endangered species of hemigaline viverrid from the Thai-Malay Peninsula, Borneo and Sumatra (Veron et al. 2006). There are also unconfirmed reports from northern Vietnam (“C. lowei“), southern China, northern Thailand and Java (Veron et al. 2006). The mount above appears to be this specimen, and was probably collected in Borneo in 1881 by Henry A. Ward. 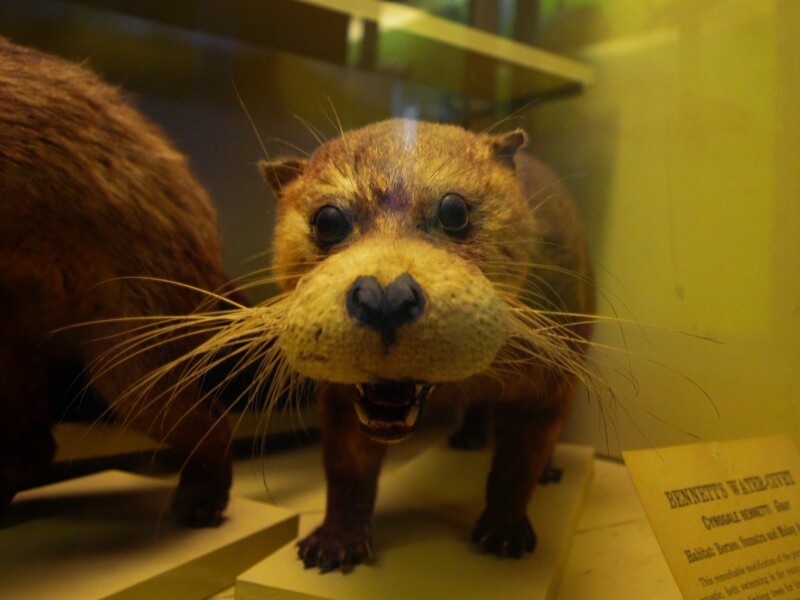 It certainly shows its age, but it’s no taxidermic aberration — photographs of live specimens show the whiskers and mystacial pads really are that ridiculously hypertrophied. The illustration above demonstrates more remarkable morphology — the nostrils open dorsally, an even more extreme position than those of seals* and otters (Pocock 1915). Pocock (1915) speculated this feature allows Otter Civets to be ambush predators, picking off unsuspecting birds and small mammals looking for a drink. Nowak (2005) lists birds and small mammals as part of the Otter Civet’s diet and treats Pocock’s speculative behavior as likely, although it still appears to be entirely hypothetical. Any nature documentarians up for filming this potential mammalian mini-crocodile in action? Anyways, Otter Civets also have adaptations for activities below the surface as their nostrils can be closed with flaps, and their ears can be closed as well (Nowak 2005). 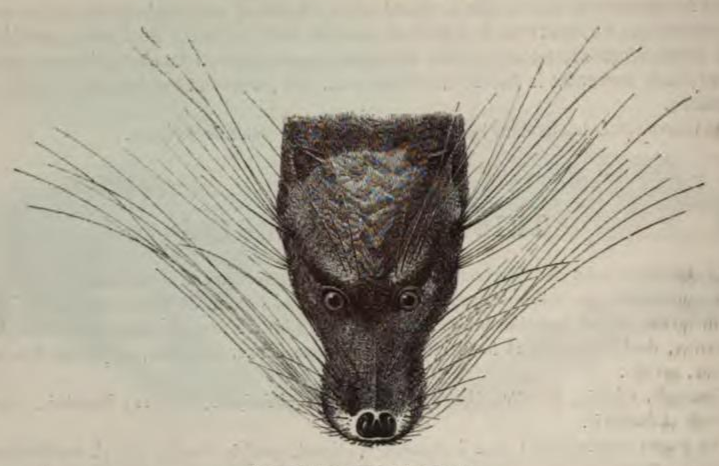 While some early workers considered Otter Civets to have large orbits (Gregory & Hellman 1939), the eyes appear to be on the small side for a civet, which is unsurprising considering the vast array of whiskers. * But not Leopard Seals, it would seem. 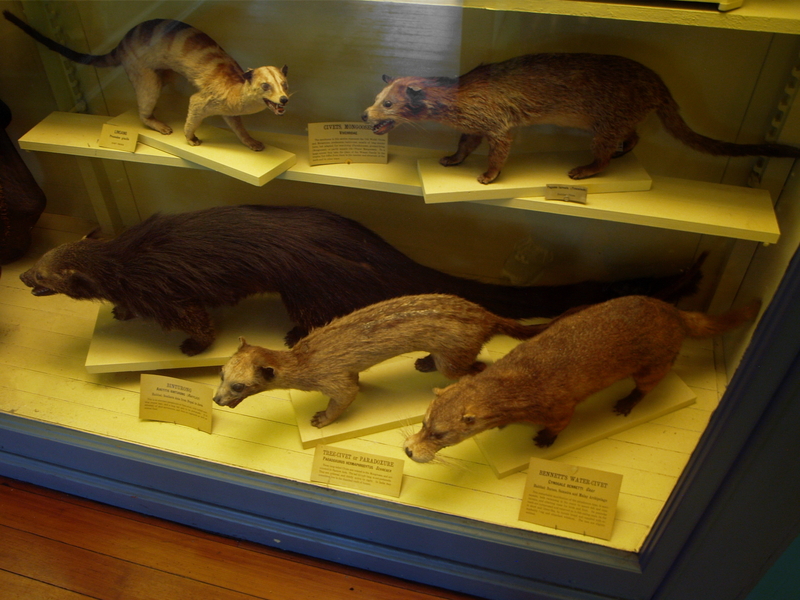 Bottom Row: Binturong, Common Palm Civet, and Otter Civet. Otter Civet weirdness doesn’t stop at the head. Despite their closest relatives being plantigrade, Otter Civets are fully digitigrade (Gaubert et al. 2005), which is rather unexpected for a semi-aquatic species. The feet are broad with flexible digits and some webbing (Nowak 2005). The tail is curiously short (compare to the civets… and prionodontid… above) and lacks specialized musculature (Nowak 2005). Due to the lack of webbing and underwhelming tail, Nowak (2005) speculated that Otter Civets are slow and unmaneuverable swimmers specialized for capturing cornered prey, which ties in with Pocock’s speculation that the abundant whiskers are an adaptation for discovering hiding prey. Aside from terrestrial species, their diet includes fish, crustaceans and possibly molluscs (Nowak 2005). All skulls from Gregory & Hellman (1939). Otter Civets are members of the clade Hemigalinae, along with Hemigalus, Chrotogale, Diplogale and, it was recently argued, Macrogalidia (Wilting & Fickel 2012). The skeletal comparisons above and below also include the Aquatic Genet (Genetta piscivora), a more distant relative that, as the name suggests, is also semi-aquatic. Gregory and Hellman (1939) discussed some minor skeletal traits shared by Otter Civets and Aquatic Genets but found the convergence to be minor. Otter Civet teeth really stand out: the elongate, serrated premolars are specialized for grasping prey while the blunt-cusped, rounded molars are specialized for crushing (Gregory & Hellman 1939; Nowak 2005). Gregory and Hellman (1939) also described an enlarged infra-orbital foramen and enlarged areas for muscle attachment anterior to the orbits which is related to the abundant whiskers and hypertrophied facial musculature, although it’s far less pronounced than what I would have expected. Curiously, there doesn’t seem to be any obvious anatomy relating to the strange position of the nostrils. Skulls from Gregory and Hellman (1939). Otter Civets have been kept in captivity and have apparently been observed foraging in water (Vernon et al. 2006), although, full disclosure, I cannot find any specific information on its behavior in water. On land it has been observed doing some surprising things — climbing trees, as well as eating fruit and insects (Nowak 2005; Wilting et al. 2010) — although most observations appear to be fleeting glimpses. Otter Civets are typically photographed nears ponds and streams and are thought to primarily inhabit peat-swamp and primary forests, although they have also been observed in logged and secondary forest (Wilting et al. 2010, Cheyne et al. 2010). However, observations of Otter Civets are becoming increasingly uncommon and it is believed habitat destruction has reduced its population (Veron et al. 2006). Nowak, R. (2005) Walker’s Carnivores of the World. This entry was posted in Anecdotal Evidence, Carnivorans, Mammals, Museum of Comparative Zoology and tagged Anecdotal Evidence, Carnivorans, Civets, Comparative Biology, Harvard, Museum of Comparative Zoology, Otter Civet, Viverrids on February 25, 2013 by Cameron.